OK as anyone who has a replica-1 knows there are some challenges to getting it working with an Apple ACI (replica of course) and even the limited run of Vince Briel's ACI for the Replica-1. So I spent the past couple of weeks as I had time really digging into this and have a solution that works well every time. First I should state, my Briel replica-1 is an older model which still has a 7 to 9V DC power input and originally came with an EEPROM not the EPROM. 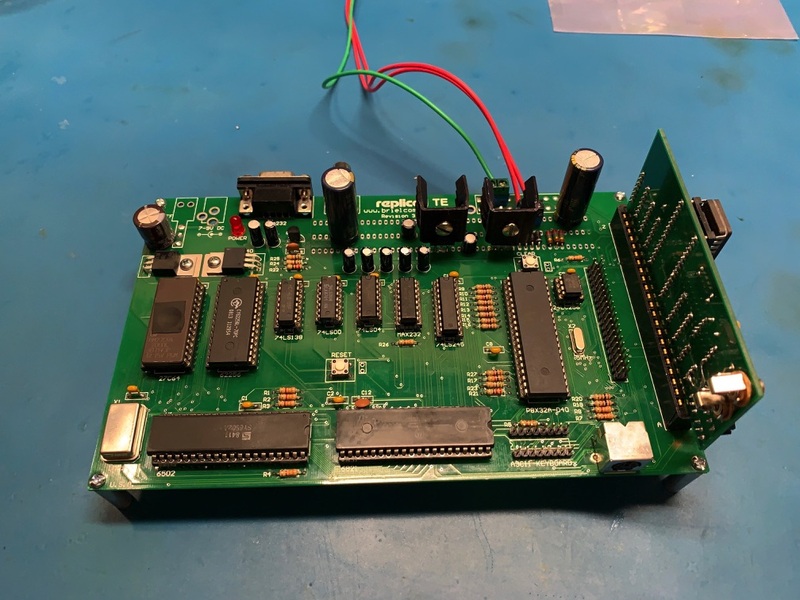 When Vince Briele asked me a few years ago to test the ACI, he sent me an EPROM to replace the EEPROM thinking it caused extra noise on the line that prevented the ACI from being reliable. It's more complicated than that. 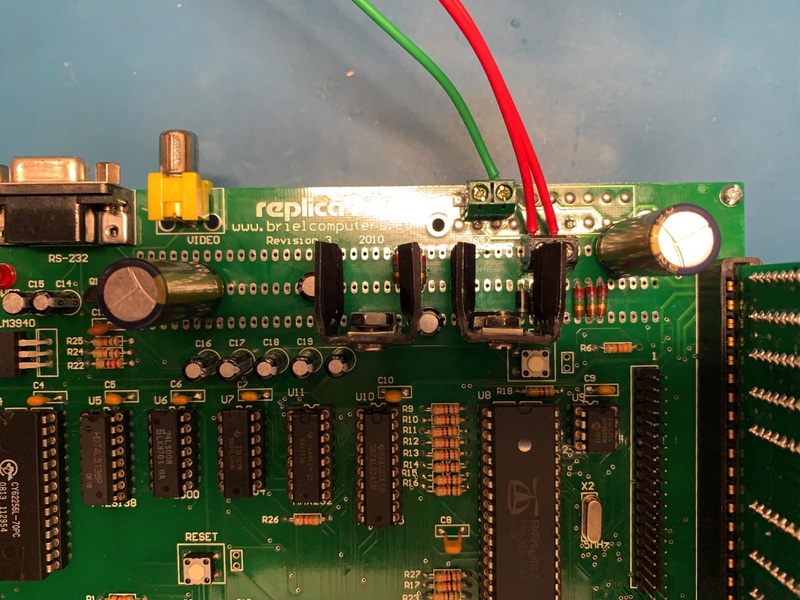 Now in the past I was able to get the Replica-1 working moderatly using a lab supply with +9V and -16V, but only consistently with a cassette player, never with an iPod. I tried pre-amps and everything, but no go. I also tried the -12 line to ground trick, but that also only worked with a real cassette player, cranked up and wasn't super consistent in operation. The real problem is that the Apple-1 ACI circuit is calibrated to unregulated aprox -20 V not -12V. There were issues even with using an AT supply with the replica-1 and the ACI. So I tried a few things using some inexpensive parts I had lying around like a Condor supply and things got better. 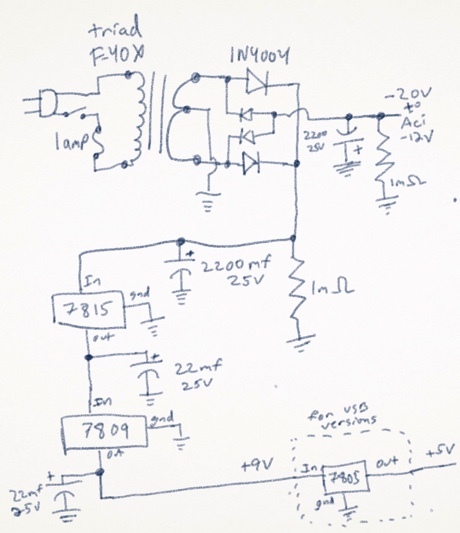 My lab supply tops out at -16V, but I had a 24V Condor supply I regulated down to about 20V which was about what the voltage is after the F-40X transformer is rectified to DC on the Mimeo or real Apple-1. This was a vast imrovement, but not practical for most people. I wanted a solution that worked with everyones replica-1. 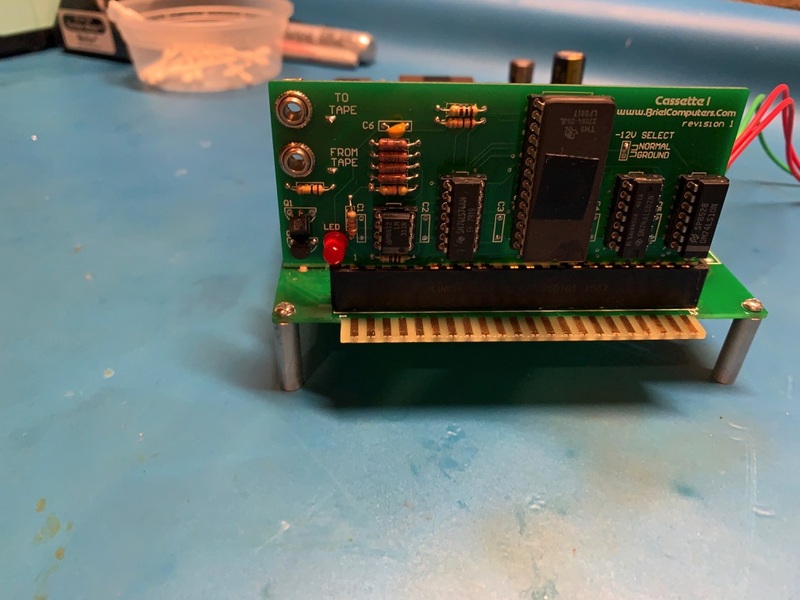 So I decided to build 1/2 an Apple-1 supply in the prototype, with a major change. I need the supply to give me the unregalted negative voltage for the ACI and +9V so you woudn't need two expensive transformers. A new F-40X transfomer is cheap from mouser. To manage heat, I daisy chained a few regulators together stepping down the voltage at each one. Feeding this new supply is a single Triad F-40X center tapped transformer which creates about +20v and -20V AC. In the prototype area of the Replica-1, I rectified the signal to DC using 1N4004 diodes. I filtered the +20V with a modern 2200uf 25V cap, and the -20V with another 2200uf 25V cap. The -20V is sent to the unregulated -20V line on the expansion port. I use the equavalent of a 1meg Ohm bleeder resistor across the 2200uf caps to drain them when the system is off. The center tap of the F-40X is tied to the replica-1 ground. The +20V is dropped to +15v using a 7815 1.5 amp regulator with a heat sink with 22mf 25V caps on the output line. That +15V line is dropped to +9V using a 7809 1.5 amp regulator with a heat sink and a 22mf 25v cap on the output side. This is then fed to the onboard 5V regulator. For USB models, you need to use your own 5V (7805) regulator and another 22mf cap on the output side. I tested this using an iPod and a cassette player. It worked just about every time, which is about as good as the Apple-1 ACI gets. The only other trick is to iinitizie the ROM basic on the Replica-1 with an E000R before you go and load basic programs. Then use E2B3R as usual to enter basic "hot". FYI: I also removed my power switch from my actual Replica-1 board so there would be no confusion as to how to turn it on/off since the new setup uses the external AC transformer and I’d hate to turn off the replica-1 from the onboard switch and not realize it’s still hot and blow something up. I will try to draw up a schematic and add some pics over the weekend when I get a chance. So now one more thing related to Briel's version of the ACI. Vince went a little filter cap crazy on it. The extra filter caps are an issue. For some reason they also affect the reliability. I swapped chips between the different boards, a replica and Vince's and the only way to get them just as reliable was to remove the extra filter caps on the Briel ACI. One more note: I did use the .1 mf cap on the ACI input side instead of the stock .01 cap. This is a common update for reliabilty. I was never able to get my ACI to work. I'll have to dig it out and try this. Looking forward to seeing more details. 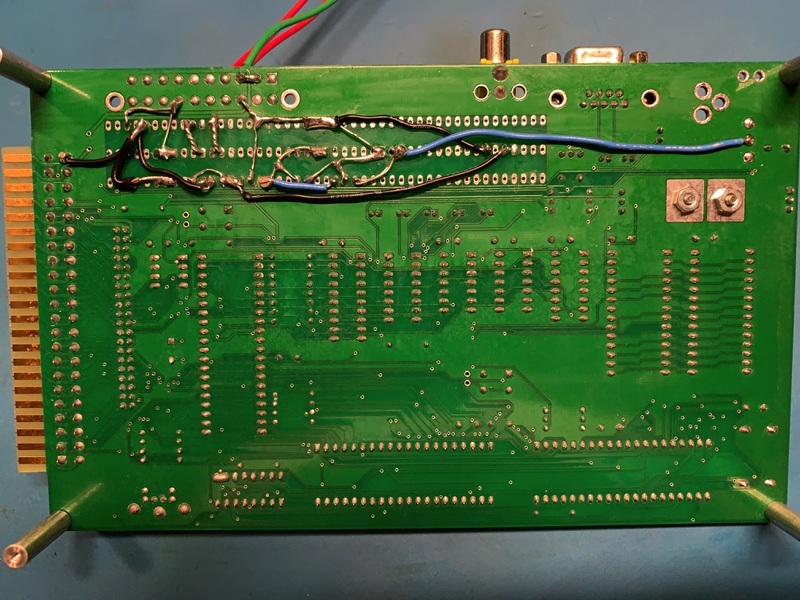 Here are pics... Now I do have the EPROM installed since it also has a slight modification the the monitor and Basic software code that I added related to maping the underscore to the actual "del" character code so I can rubout characters using the Del key on my PS/2 keyboard.